The Bloomly is dedicated towards becoming your best self and constantly striving towards growth in life. Whether it's through enriching adventures of travel, finding confidence through style, or learning to deal with the rough stuff life throws at you, Bloomly offers content that will help you grow, bloom, and flourish in everything that you do. At Bloomly, it's more than a fun trip to the Almafi Coast or a new outfit, it's about experiencing new things that build on your identity or about finding expression through style. Why Should You Read The Bloomly? The Bloomly is meant for the people that are willing and searching for new ways to improve themselves: whether that's through trying new things, finding new passions, focusing on mental health, or simply learning from our own experiences. You should read the Bloomly to become your best self. The Bloomly will entertain you, make you question ideas, and help you to focus on your own personal growth and self-improvement. 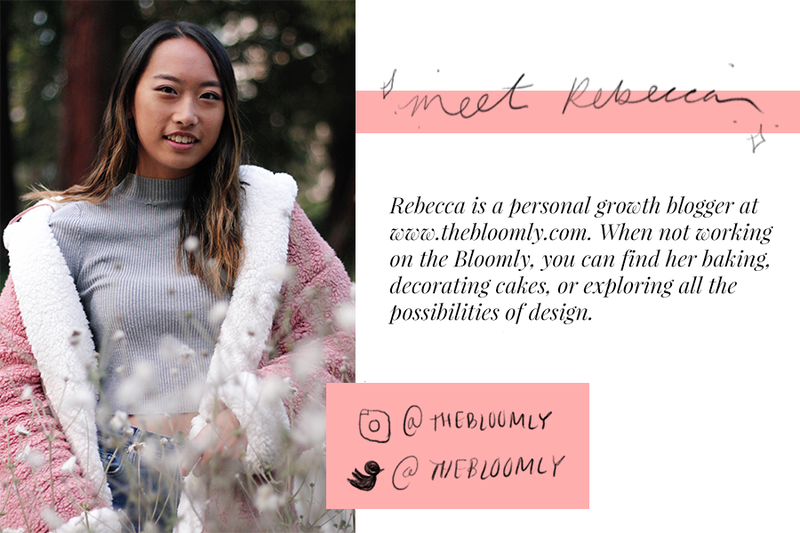 Rebecca originally started the Bloomly wanting to share her creativity and ideas, stepping into a lifestyle that she had always imagined. But that changed. While she still has the same passion for baking anything and everything as well as buying cute stationery that she probably doesn't need, throughout her time blogging, she discovered that blogging can be a way to connect with others, to share stories that other people can relate to that can go on and benefit their lives. While also working towards becoming her best self, Bloomly reflects that and shares the journey. one. I collect keychains from almost every place that I travel to. two. I LOVE cake decorating. four. Some of my most loved TV shows include Quantico, Revenge, and Jane the Virgin. five. love making handmade cards. six. I self taught myself how to knit. seven. My favorite snack is white cheddar popcorn. eight. I play the cello. nine. I (used to) play the piano. ten. Ben & Jerry's half baked ice cream is my all time favorite ice cream. On every blog, bloggers include their social media handles and their emails, asking readers to reach out. And that's valid, these are ways for the bloggers and the readers to connect and really get to know each other. However, every time I see this contact information, although I may decide to follow their social media, I feel like I don't really reach out to them and actually start up conversations because I'm afraid that they don't want to talk to me. I want to make this clear: I absolutely want you to reach out. Not just by following me on social media, but by truly engaging with me and forming a conversation. Whether you simply want to share something that might have popped up in your head while reading one of my posts or you want someone that will offer some advice (which I will do my best on, even though I'm probably not qualified for it), or you need someone to just talk to, I hope that I can be that person for you.